- The world's first Oral Care system enables "7 items" measurements.- New Release of 'Saliva Testing System'. | ARKRAY, Inc.
New Release of 'Saliva Testing System'. 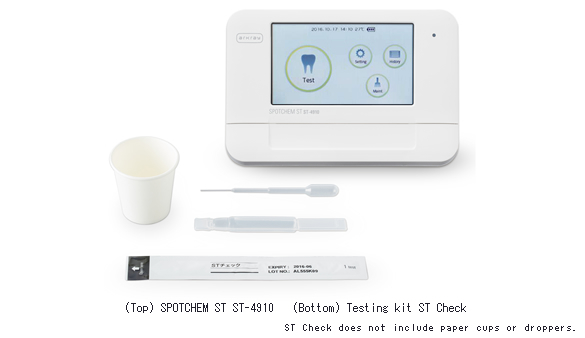 ARKRAY Inc. will release SPOTCHEM ST ST-4910, the world's first salivary testing instrument to check the oral environment, and its testing kit ST Check on 24 March, 2017. This innovative saliva testing system measures 7 items including 'Tooth health, 'Gum health', and 'oral cavity cleanliness' within 5 minutes. In recent years, a connection has been demonstrated between the oral environment and various internal disorders such as diabetes, which makes the oral care important not only for local ailments within the oral cavity but also for the perspective of preventing ailments in the whole body. Taking these new indications into consideration, ARKRAY Inc. (hereafter, ARKRAY), took a closer look at the relationship between troubles in the oral cavity and saliva and developed a testing system that measures multiple items using saliva as its sample. The saliva testing system being released by ARKRAY tests saliva sample using the specialized device SPOTCHEM ST ST-4910 and the testing kit ST Check to simultaneously measure 7 items deeply related to troubles within the oral cavity within 5 minutes. 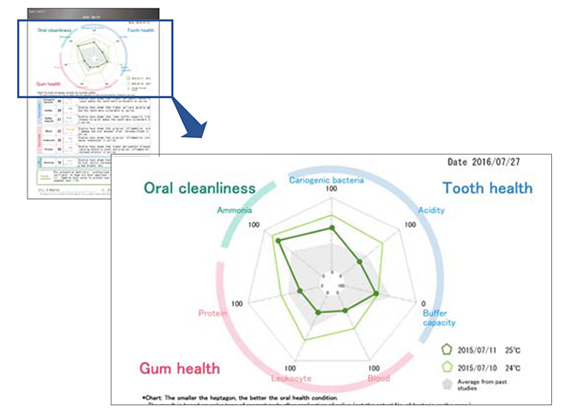 Measurement results are visualized on a radar chart allowing customers to understand their oral condition, which is often difficult to recognize on one's own through the objective data. ARKRAY will continue to engage in new product and service development using its fundamental technologies to expand its range of business. * This device and testing kit are intended for research purposes. Measurement results cannot be used to diagnose or to assist in diagnoses. One test can measure 7 items that are deeply related to troubles in the oral cavity. Measures the acidity and buffer capacity (the saliva's ability to neutralize acids) of saliva. In general, if the saliva can easily turn acidic, cavities are considered more likely to occur. Measures the erythrocyte, leukocyte and proteins present in saliva. These items may be detected in the saliva in the presence of gum diseases due to bleeding within the oral cavity. Ammonia is said to exist in saliva relative to the total bacteria count in the oral cavity. Measuring ammonia in the saliva estimates the bacteria level within the oral cavity. Easily operated by simply dropping the sample on the test strip and pressing the start key. Measurement results can be obtained after 5 minutes. Measurement results are visualized in an accessible radar chart format. In addition comments can be added using a specialized software program. The device fits in the palm of a hand and can be installed without taking up a lot of room. Also the 430 g lightweight design allows easy transport. Measurement results can be produced simply and rapidly using the 3-step saliva test. This product will be sold through ARKRAY Global Business, Inc.
ARKRAY Global Business, Inc. is ARKRAY's overseas distributor.